I've been trying to grow my curly hair for over a year now and it doesn't seem to be getting any longer. I know it's not at it's full length because it's been longer than this before but since I cut it short it won't seem to grow back. I eat pretty healthily and exercise so I don't think it's that. I really want it longer as the curls are much nicer and more manageable, so I was wondering if anyone can give me any advice as to why it's not growing or what I could do to make it grow? bump, I want an answer to this too. I cut my hair last January, taking about 2 inches off. Since then I've been trimming my hair myself, never taking more than an inch off and I've only trimmed it maybe 3 times in the past year. Instead of growing longer, its just getting curlier. The one time I straightened it, about 2 months ago my hair was long! Longer than its been in years, but when its curly it just stays at the same length; right at my shoulders. What can I do? yous both really just need to let time do its thing, but there are a few things that can help it along the way. ive noticed quiet a bit of growth in the past few months, so i guess im doing somthing right. rosemary, nettle, ginger, peppermints, and marshmallow root are all meant to be rather good for growth. especially when you give your scalp nice message once a day to help with the blood flow. somthing that im going to try today, is hibiscus, ive never tried it before, but ive read its great at encouraging growth and helps cleanse the hair. Patience is key! We all know our hair straight is longer than it is curly, and for some of us, the weight of our hair doesn't pull the hair down enough to make it look longer curly until it's gotten REALLY long. When I first cut my hair and went natural, my hair was 4 inches long straight and was around 2 inches curly. My hair is between 12-13 inches long when straight now, and is 3-4 inches when curly. I think my hair will at my waist and will shrink to my shoulders curly. But short of texturizing it (NOT an option), what can I do? Nothing except give it as much love as I can. Note: rosemary stimulates blood into scalp and braids locks and seals the moisture. Everyone's hair grows at different speeds. I've been growing mine out for 3 years now and it's maybe 3 inches longer at the max. (I trim it from time to time). Meanwhile, my co-worker has been growing her hair out from a bob for a few months now, and it's grown probably 7 inches! 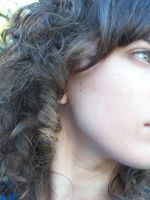 Curly hair takes longer to grow because it takes longer for your natural oils to travel down to the ends of your hair. That's why scalp massages help. Hair growth is also dependent on--as mentioned in posts above--supplements, sleep, stress, exercise, hair type, weather/outdoor elements, heat styling, and I wouldn't doubt if ethnicity and genes played an important role.